We've never been big on Valentine's Day in my house. If the kids are lucky, I'll fix them something for lunch that is shaped like a heart, and if I'm lucky, Joel and I will get away for a nice dinner out without the kids. Last year was an unusual case, however. Because Cael's teacher had requested homemade valentines for his preschool class and used words like "unique" and "non-commercial", I went into full perfectionist mode and spent the better part of a week on photo shoots, testing different mustache styles, and enduring painful envelope-decorating sessions that left us both covered in enough pink and purple marker to look like crash test dummies. I knew I couldn't handle another exhaustive art project, especially with my current state leaving me with about as much energy as a lethargic housecat. (FYI, get ready for me to start blaming just about everything on my "current state".) I also had an extra boy in need of Valentines this year, so I took a quick trip to Michael's in hope of finding some inspiration. 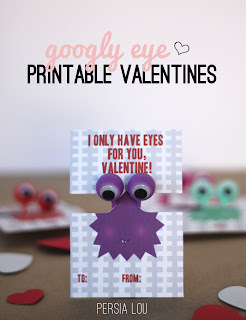 I developed a few ideas that were marginal or labor-intensive, so I threw them all out when I came across a small mesh bag of googly-eyed rings. I knew right away that it was just the type of toy that my kids would love and my dog would love to systematically chew and disassemble, so with everyone appeased, I bought several bags of the rings. I wasn't sure exactly what I'd do, but I envisioned the phrase "I only have eyes for you" coming into play. It would be perfect-- something easily printed on cardstock, still homemade and not totally impersonal, with opportunity for Cael and Graham to write their names for good measure. Major props go to Persia Lou for making my life easier! I'd hit this one out of the park. A few days later when I went to design the card portion of the valentine, I struggled a bit with how to affix the ring. Originally I had planned to cut two holes in the card so that a bit of ribbon could be slipped through and tied around the ring, but the knowledge that I would be tying nearly 50 rings to relatively thin cardstock gave me hallucinations of mustaches, so I took to the internet for ideas. And then I saw it. Someone had stolen my idea. Or rather, I'd unknowingly stolen hers. And what's worse, she'd done it so much better. Persia Lou's craft blog included step-by-step instructions for making an "I Only Have Eyes for You" ring valentine with convenient cut-outs and a PDF printout for the card itself. I was simultaneously irritated and relieved for this portion of the work to be done for me, so I quickly printed out one sheet of the cards only to find that my printer's bias caused the colors not to match, and the cards to print out too small for the rings to stay affixed to the paper. So I might have had to help Graham keep his letters in a row, but I was proud of my big boy for making his name so neat! Cael was also not a fan of the gray background, so with the example provided for me, I quickly made up my own version of someone else's originality, and spent what felt like hours cutting paper for the duration of the night. But when it was time to assemble, the boys had a great time writing their names, accidentally tearing up the paper, watching me reprint and re-cut the cards, butchering the names of kids in their classes, and loving every minute of it. I LOVE those!! I'll have to remember them for the future. 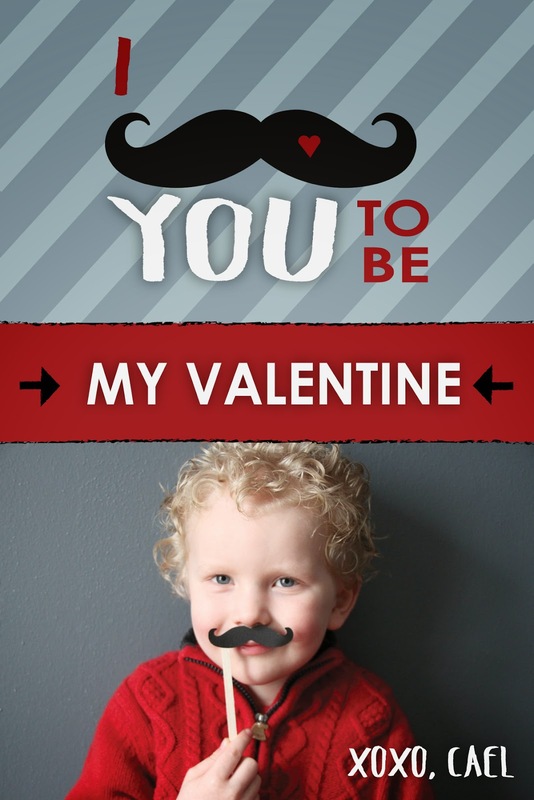 Very nice, wish I was on the Valentine committee, you would win First Place! !